We’d love your help. Let us know what’s wrong with this preview of Never Swim Alone and This is a Play by Daniel MacIvor. Never Swim Alone is a play about two men locked in a deadly competition. This Is a Play is a hilarious postmodern romp through the interior lives of actors in a bad play. To ask other readers questions about Never Swim Alone and This is a Play, please sign up. These two plays were both of an "experimental" nature. Somewhat of a cross between Tom Stoppard and Jean-Claude van Itallie, perhaps. I enjoyed both of them, though Never Swim Alone was a little more confusing and with less clear purpose. This Is A Play was actually quite funny and I would seriously consider doing it if I had the right performers. The main point of it is that three actors are performing a play and while we do hear some of their dialog, we mostly hear their thoughts. What makes it These two plays were both of an "experimental" nature. Somewhat of a cross between Tom Stoppard and Jean-Claude van Itallie, perhaps. I enjoyed both of them, though Never Swim Alone was a little more confusing and with less clear purpose. This Is A Play was actually quite funny and I would seriously consider doing it if I had the right performers. The main point of it is that three actors are performing a play and while we do hear some of their dialog, we mostly hear their thoughts. What makes it quite funny is that they don't think much of each other or the play itself. I saw a student production of Never Swim Alone at the Sears Drama Festival when I was in grade 11. This one-act play changed my perception of the theatre, and challenged my preconceived notions of what a play "should" be. The unconventional style of Daniel MacIvor introduced me to the realm of postmodernism. In my first year of university, I checked out a copy at the library in order to prepare for an audition for a local production of the play. 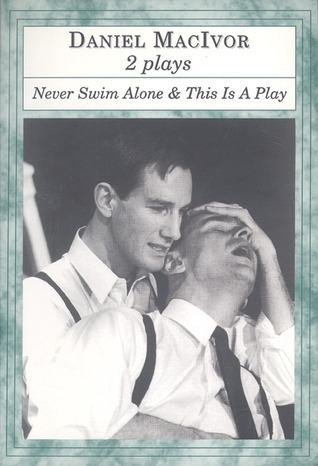 Although I wasn't cast in Never Swim Alone, I rece I saw a student production of Never Swim Alone at the Sears Drama Festival when I was in grade 11. This one-act play changed my perception of the theatre, and challenged my preconceived notions of what a play "should" be. The unconventional style of Daniel MacIvor introduced me to the realm of postmodernism. In my first year of university, I checked out a copy at the library in order to prepare for an audition for a local production of the play. Although I wasn't cast in Never Swim Alone, I received a role in another show that was a part of the same festival. The three actors cast in Never Swim Alone were perfect for their respective roles, and watching them onstage was a learning experience in itself. You should read this play - but, you should really see a live staging as well, if you can. To read the unusual syncopated words of the characters is one thing, but to see a well rehearsed rendition of the play is quite the theatrical experience. This is my absolute favorite play of all time. It tells a dark, tragic story framed in a quirky surrealistic setting. Its the perfect play for actors, directors, designers, and really all aspects of theater. It is one of those pieces that resonates and speaks volumes even just reading it. An absolute masterpiece. Daniel MacIvor was born in Cape Breton, Nova Scotia in 1962. He is a stalwart of the Canadian theatre scene, having written and directed numerous award-winning productions including See Bob Run, Wild Abandon, 2-2-Tango, This Is A Play, The Soldier Dreams, You Are Here, How It Works, A Beautiful View, Communion, Bingo! and his work has been translated into French, Portuguese, Spanish, Czech, German Daniel MacIvor was born in Cape Breton, Nova Scotia in 1962. He is a stalwart of the Canadian theatre scene, having written and directed numerous award-winning productions including See Bob Run, Wild Abandon, 2-2-Tango, This Is A Play, The Soldier Dreams, You Are Here, How It Works, A Beautiful View, Communion, Bingo! and his work has been translated into French, Portuguese, Spanish, Czech, German and Japanese. From 1987 to 2007 with Sherrie Johnson he ran da da kamera, a respected international touring company which brought his work to Australia, the UK and extensively throughout the US and Canada. With long time collaborator Daniel Brooks, he created the solo performances House, Here Lies Henry, Monster, Cul-de-sac and This is What Happens Next. Daniel won a GLAAD Award and a Village Voice Obie Award in 2002 for his play In On It, which was presented at PS 122 in New York. His play Marion Bridge received its off-Broadway premiere in New York in October of 2005. In 2006, Daniel received the Governor General’s Literary Award for Drama for his collection of plays I Still Love You. In 2007, his play His Greatness won the Jessie Richardson Award for Best New Play in Vancouver. In 2008, he was awarded the prestigious Siminovitch prize in Theatre.